The Florida Derby is one of the key Kentucky Derby prep races and the blockbuster of the winter racing season at Gulfstream Park. Three of the Derby winners since 2005 have used this premiere race as a stepping stone to the winner’s circle in Kentucky. One other winner in this timeframe placed second in the Kentucky Derby, writes Laurie Ross of Ironmaiden Thoroughbreds. The Florida event is also a key race for Preakness and Belmont Stakes contenders. Nine colts who contested the Florida Derby later hit the board in one or both of these of the Triple Crown races. This year’s field appears evenly divided between horses who belong and those who don’t. #9 UPSTART (8-5) (Flatter - Party Silks, by Touch Gold) regressed slightly speed figure wise in the Fountain of Youth after a huge score in the Holy Bull, but trainer Rick Violette cautioned beforehand that this might be the case. Upstart did get a little tired, drifted and it cost him the victory via disqualification, despite his pulling away from Itsaknockout by 2 ¾ lengths. Upstart has the pedigree to handle 1 ¼ miles, he outclasses this field and despite drawing the far outside post, jockey Jose Ortiz can put Upstart in a good position. #4 ITSAKNOCKOUT (2-1) (Lemon Drop Kid - Stormy B, by Cherokee Run) got carried out a little bit by the drifting Upstart, but it was clear that Itsaknockout wasn’t going to win. They gave him the prize money anyway. Itsaknockout is a half brother to the multiple stakes winning miler Storm Power. Their dam is a half sister to the graded stakes winning turf router Rush Bay and the multiple stakes placed sprinter/miler Miss Inclined. This is the distaff family of 2012 Kentucky Oaks heroine Believe You Can. I’m leery of Itsaknockout winning at 1 1/8 furlongs, but he’s borderline for the distance and with the right trip, anything is possible. His trainer, Todd Pletcher, won this race last year with Constitution. #7 MATERIALITY (7-2) (Afleet Alex - Wildwood Flower, by Langfuhr) is the “other” Pletcher horse. He’s been perfect in two starts, both at Gulfstream, including a 5 ¾ length win in the Islamorada Handicap at 1 1/8 miles. He beat Quimet by 16 lengths that day. The well-bred colt is a half brother to My Miss Sophia, who galloped to a 7 ¼ length victory in the 1 1/8 mile Gazelle (G-2). 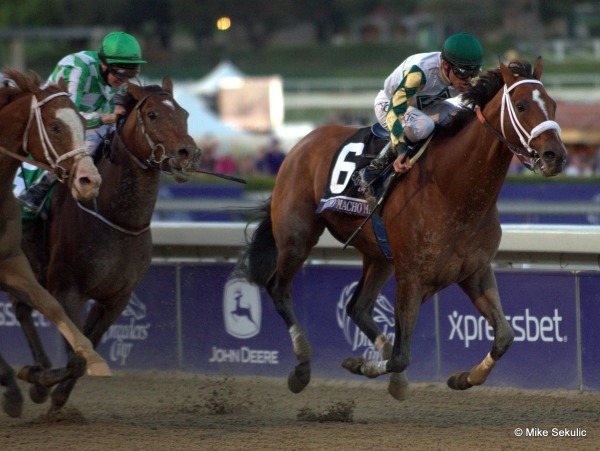 She also finished second in the Kentucky Oaks to Untapable. Their dam is a stakes winning sprinter who is a half sister to the graded stakes veteran Eye of the Tiger. Another half sister bore Travers winner Afleet Express. Materiality is a late improving colt, is already a winner at the distance, and has a serious upset chance. #1 AMI'S FLATTER (8-1) (Flatter - Galloping Ami, by Victory Gallop) rebounded in the Tampa Bay Derby to finish second, but was no match for Carpe Diem. There’s some quality in this colt’s family. Ami’s Flatter’s dam is an unraced full sister to stakes winner Victorious Ami, dam of multiple stakes winner Ami’s Holiday, a winner from 1 1/16 miles to 1 ½ miles. Ami’s Flatter has the pedigree to win the Belmont Stakes without drawing a deep breath, but he’s starting to look like a one paced grinder. A jock switch to Castellano, who won last year’s Florida Derby could help. Unless they switching running tactics last minute, look for him to be rolling late and picking up the pieces. #3 INDIANAUGHTY (20-1) (Indian Charlie - Be Fair, by Exchange Rate) picked a great place to experiment on the dirt. He won his maiden over Polytrack in England and transferred that form to the Gulfstream turf for an allowance win. Shipping to California, Indianaughty dueled through glacial fractions over Tapeta before throwing it into reverse in the stretch to finish second to last. The million dollar question is – can he handle the dirt? Well, he’s bred to run on it. His dam won the Lake George (G-3) on dirt. She’s a half sister to Macho Again, winner of the Stephen Foster and Jim Dandy. Macho Again was second in the 2008 Preakness and 2009 Woodward. Additionally, all of their half siblings preferred dirt. So, Indianaughty should handle the dirt – will he run through the kickback and is he up to this caliber of runners is another story. If you haven’t lost all of your money in the previous 13 races, why not toss him on your exotics tickets. Exotics Contender. #6 MY POINT EXACTLY (30-1) (Concord Point - My Golden Quest, by Coronado's Quest) will attempt to win a 1 1/8 mile race over the dirt after winning a one mile stakes. On the turf. Last September. Either the racing secretary was calling in favors to fill the Florida Derby field or somebody in the barn has been smoking the hay. The pretty gray gelding’s dam is a multiple stakes winning half sister to My Golden Song, who paced in the 2006 Holy Bull Stakes. His second dam is a multiple stakes earner of over $300,000. My Point Exactly has won over the dirt, but this is a very odd place for him to make his three year old debut. Last year’s speed figures aren’t that inspiring, however, he may have improved enough over the winter to round out the superfectas at long odds. help keep him focused on racing now that he doesn’t have the fillies on his mind. He’s been whipped twice at Gulfstream by optional claimers, including a distant fourth place finish to Itsaknockout. His unraced dam is a half sister to a listed runner who preferred synthetics and turf. #5 QUIMET (20-1) (Birdstone - Comanche Star, by Saint Ballado) was placed third through DQ in the Islamorada Handicap, but even that didn’t bring him any closer to the winner Materiality. Quimet is a half brother to stakes winner Canonize and Bayshore (G-3) winner Declan's Warrior. Quimet’s third through fifth dams are blue hens. My comment last year was to keep an eye out for him when he switches to dirt, because he and his half siblings all prefer the surface. Quimet trainer Nick Zito has been known to pull a fast one in the Florida Derby – his longshot winner Ice Box is a prime example. Quimet has potential, but I don’t think he’s ready for the spotlight just yet. #8 DEKABRIST (30-1) (Street Boss - Shutterbug, by Deputy Minister) cost $50,000 as a yearling and his connections have spent more than that in entry fees alone. The poor horse made 13 starts, three starts just in January and hasn’t hit the board since last June. Track bias: Seven races have been held at 1 1/8 miles this Gulfstream Park meet. 43% of the winners were pace pressers while 23% closed from the back of the pack. But this is the Florida Derby. We’ve seen winners go gate to wire, sit behind the pace or storm from the back of the pack. Here are some eye opening stats. All except one Florida Derby winner prepped at Gulfstream in either the Fountain of Youth, an allowance race, or the Holy Bull (Empire Maker finished second in the Sham Stakes in California). All except two Florida Derby heroes finished first or second in their previous start (Ice Box was fifth in the Fountain of Youth, Friends Lake was third in the Holy Bull). In the Upstart vs. Itsaknockout, I’ll side with Upstart. He has the better pedigree for getting the distance. Yes, he got a little leg weary in the Fountain of Youth, however, his post race works are strong and he should bounce back here. Materiality is another one that I’ll be watching closely. He has the potential to upset the race. Ami’s Flatter has some nice late-pace speed figures He’s had only one bad race and could be overlooked. He’ll be rolling from the back of the pack.